Jason Seiler has signed up to help out a good cause. The Drawing Dreams Foundation provides art supplies to hospitalized children through children's hospitals' Child Life and Artist-in-Residence programs. Artists and talented children have donated artwork to be sold to raise money for this great cause. Jason has donated an oil painting of his friend Cory Chisel (of Cory Chisel & The Wandering Sons) and both of them will be at the event in the New York School of Interior Design, March 1, 2012 from 6 to 8pm. Guests will enjoy cocktails, hors d' oeuvres, an intimate performance by singer songwriter Cory Chisel, and be able to bid on more than 60 works of art and fine prints that will be auctioned on charitybuzz.com. 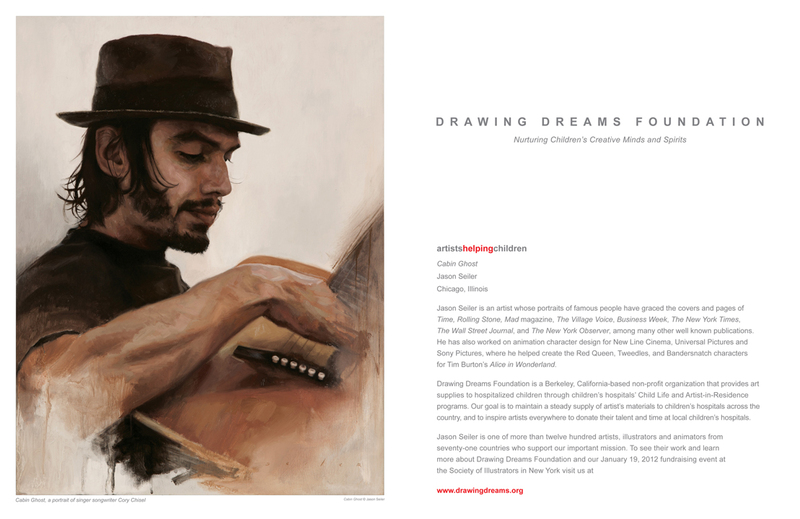 Proceeds from the auction will help Drawing Dreams purchase and deliver art supplies to hospitalized children.